THE WEST POINT BAND PRESENTS: MARCH FORTH! 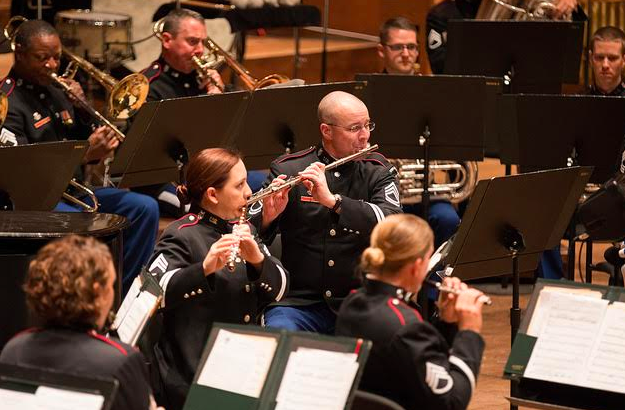 The West Point Band continues its 2018 Winter Concert Series in Albany, New York on Sunday, March 4 at 3 p.m. This community concert, entitled March Forth! will take place at The Egg, in the Empire State Plaza’s Center for the Performing Arts. The band invites those living in Albany and the surrounding area to join in celebrating the end of winter with great music for wind ensemble! The West Point Band encourages people to RSVP to the event on the band’s event webpage, http://westpointband.army.mil/winter-concert-series/march-4th.html. This concert is free and open to all. March Forth! pays homage to the way Sousa’s own band played concerts, highlighting masterworks, soloists, and a multitude of marches for military band. The band will show off its marching skills (musically speaking, that is) with an assortment of military marches, interspersed with incredible works for concert band, including classics such as Robert Russell Bennet’s “Suite of Old American Dances” and Arthur Sullivan’s Ballet Suite from “Pineapple Poll.” The band will feature its principal trumpet and euphonium players, Staff Sgts. Andrew Garcia and Phil Broome, as well as the band’s vocalist Master Sgt. MaryKay Messenger. Established in 1817, the West Point Band is the Army’s oldest musical organization and continues to provide world-class music to educate, train, and inspire the Corps of Cadets and to serve as ambassadors of the United States Military Academy and the Army to local, national, and international communities. For concert information, cancellations and updates, call 845.938.2617 or visit www.westpointband.com.